You'll discover how to use standards-based web technologies -- such as XHTML, CSS, and Ajax, along with video and Flash -- to develop applications for a wide range of users and a variety of devices, including the mobile Web. You'll also learn specifics about this target audience, especially the key over-50 age group, whose use of the Web is rapidly growing. 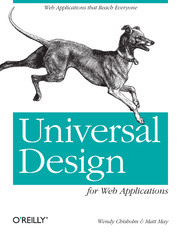 Universal Design for Web Applications provides you with a roadmap to help you design easy-to-maintain web applications that benefit a larger audience.